Chautauqua was created in 1874 near Lake Chautauqua in New York. It was originally developed as a local program whose idea was to create a culturally enlightening experience. For this Chautauqua, many well-known lecturers, musicians, and ministers were brought in to entertain the locals. This Chautauqua program still thrives today. Over the years of its existence, it has become dramatically advanced and highly successful. In the early 1900s, the Chautauqua movement started to take shape. The Chautauqua Movement was a period of educational development. The program's promoters would recruit well-known people to travel from town to town in the Midwest to exhibit their talents. Some small towns in southeastern Indiana celebrated Chautauqua events, including Greensburg, St. Paul, and Burney, as well as in towns across the region. "It was similar to a big top circus. The event was in town for a week and had a tent," event director, John Pratt said. President Theodore Roosevelt called Chautauqua "the most American thing in America." The Chautauqua program was founded John Pratt. Pratt, a social studies teacher at North Decatur High School, realized that in the ever changing world of education, there was a void in inspiration. He wanted to show his students that greatness occurs everywhere, even in small cities like Greensburg, Indiana. Thus was born Chautauqua, a celebration of diversity and a way to access the innate greatness that is within us all. John Pratt's original vision for this program was to create a great school event. His goal was to recruit talent from across the region to share their talents with students during the school day. This is just what he did during the first Chautauqua event. Pratt coordinated several esteemed speakers and two talented opera singers. He also hosted an evening event, which was slightly different from the daytime program. By the third Chautauqua event, the program was thriving. Thanks to the support of the community, funding was available to host a guest from Vermont. Rosemarie von Trapp was able to fly in all-expenses-paid to participate in Chautauqua. She was a member of the von Trapp family whom the musical, "Sound of Music," was based on. Pratt hosted nine Chautauqua events at North Decatur High School before he accepted a position at his alma mater, Greensburg Community High School. This has allowed the Chautauqua program to grow even more due to the size of the school, its resources, and its auditorium. Currently, it a semi-annual event hosted in the fall and spring. The Greensburg Community High School Chautauqua has hosted numerous national and international talents including guests from Belgium, Jerusalem, Australia, and England. The generous donations of local supporters and organizations like the Indiana Arts Commission have enabled Pratt to recruit these amazing guests. It has also the inspiration behind hundreds of projects by the students of Greensburg Community High School. Each year, members of Mr. Pratt's U.S. History and Sociology classes create a project. This project is centered around the student's talents and interests with only one stipulation: it must be great! Projects have ranged woodworking to fundraisers for non-profits to car shows to the creation of this website! 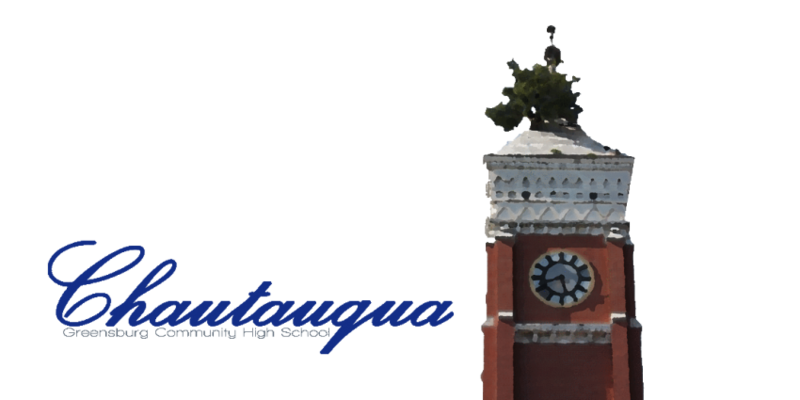 Chautauqua is currently in its sixteenth year of existence in Decatur County, and its seventh year at Greensburg Community High School. As it continues, it is our hope that you can experience it with us and see how history comes alive through this program!